Eating out is always a bit of an adventure, only more so when you have to eat gluten free because of celiac disease. You never know if you might get ill due to gluten contamination. But, just like anyone else dining out, there is always the chance of a great meal or a lousy one! We ate out Saturday night at White Orchids at The Promenade in Center Valley. A good friend suggested it as having a great gluten free menu. 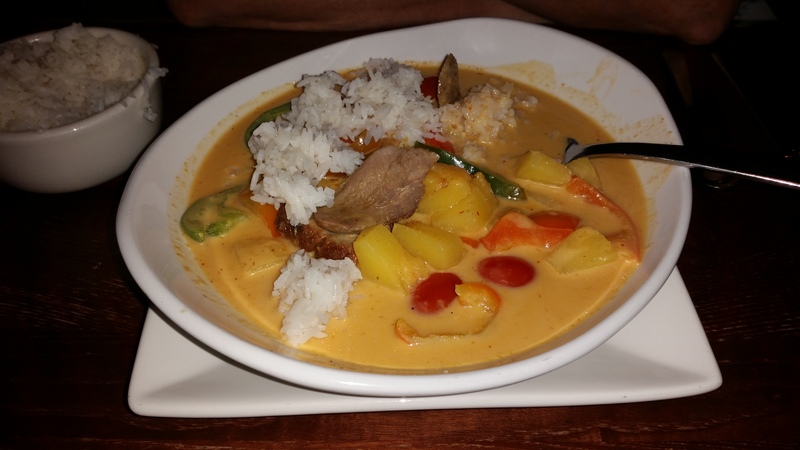 So we went for supper recently and I was excited at the prospect of wonderful Thai dishes. I should start by saying that my guy loves spicy Mexican food but I am not so sure on his love of Asian flavors. However, I adore Asian food and in my past gluten eating life made many batches of potstickers, a multicourse dim sum dinner party, lots of stir fries and many other Asian treats over the years. 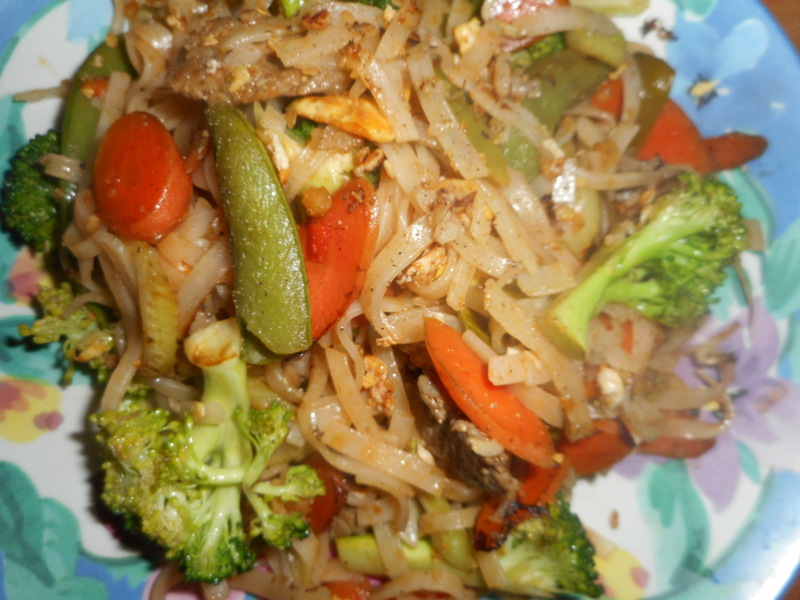 I still make stir fries, my version of fried rice and my take on Pad Thai. My sister’s wedding reception was at a great Thai restaurant in Massachusetts and I have eaten a number of very good Thai dinners in the past. 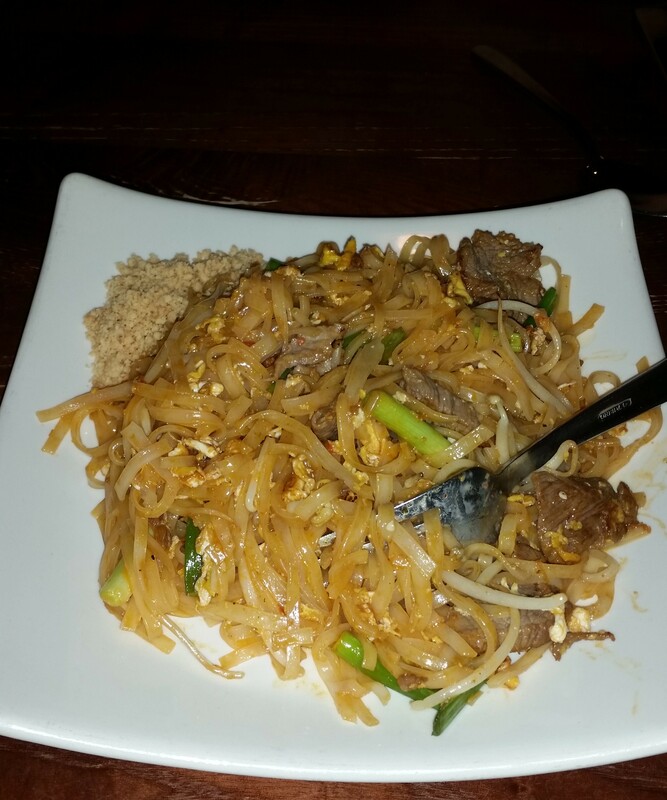 So, based on all that, it is my feeling that I do know a bit about Thai foods. We ordered a tray of potstickers to start off and both of us got soup. The chicken potstickers were tiny, bland and utterly boring. They were steamed, not fried as I normally associate with a potsticker; they stick to the pot when fried which gives them that name! They were more shaped like shu-mei than a potsticker. The blackish dipping sauce had virtually no flavor at all. My own soy dipping sauce has garlic, ginger and scallions blended in as well as sesame oil. It is crammed with flavor when you pour some over a tender potsticker. Too bad I didn’t have some of my sauce with me to rescue those sad dumplings. Neither of us wanted the sixth sticker but I urged Joe to eat it. Better him than me! Joe had ordered coffee at the start of the meal and it showed up lukewarm. We sent it back and got another cup of….lukewarm coffee. He was pretty disgusted that they couldn’t bring a hot cup after being told that the first one was not hot. Not good. The server was a nice young lady but I don’t think she was perceptive at addressing our concerns. The soups arrived and I was again assaulted by bland; my coconut Thai soup had slices of mushroom and two fat shrimp but not much to get excited over. Sadly, there was little flavor in the thin broth. Joe’s lemon grass soup was much better: the pungent lemongrass dominated the flavor of it overwhelming his two shrimp. I gladly finished it for him. It was the best thing I ate all evening. My beer, Omission arrived, the waitress said it was GF when we ordered; I was excited to try it though when I reviewed the bottle, no where did it say “GF”. So I asked the server, she trotted off and soon returned to say that the owner and the manager both said it was safe. Good to hear but honestly, I think a quick stop by from either of them would have allayed my fears a heck of a lot more and would have been the politic thing to do. I drank some but was too scared to really enjoy it. Those red things are grape tomatoes. They didn’t seem to go with the rest of the dish but they added lots of color! When the entrees arrived my duck with pineapple curry sauce came first so I was happily trying it when Joe’s beef pad Thai showed up. Duck is a favorite of mine, especially the breast. I was not impressed by the bland sauce, the canned pineapple or the sad chunks of duck that felt like they had spent the day in a warming dish waiting for someone to order a duck entrée. The dish had little duck flavor and was uninspired to put it mildly. I did take the Pad Thai leftovers home and added stir fried carrot, celery, snap peas and broccoli. Better! Pad Thai.2 as revised by me for lunch the next day. Luckily for me, my man did not care for the beef in his noodle dish and we swapped entrees. Unluckily for me, his was much spicier than my dish and so I was unable to eat more than half of it due to the hotness of the spicing. It was okay flavor wise although there were no veggies other than bean sprouts and an occasional sliver of scallion. Joe loves pineapple and green pepper so each of us was slightly happier for the switch. Neither entree impressed us especially considering the recent award this restaurant had won as to having the best gf menu. We declined dessert: I mentally shuddered at what might come of that course if we partook. Maybe their great chef was sick or on vacation that night or his assistant had made our meal. I don’t know. Something seemed off. It is pretty rare we both are so dissatisfied with our dinner out. When you pay $73 before tip and yes; we gave a good tip, you expect great food from a beautifully set up restaurant that has just won an award. And when you point out problems one would expect them to be promptly corrected….so disappointing. We will not be going back; I would have to drag him there. Darn on how this meal turned out as I really love good Thai food! Guess I will keep making my own pad Thai and get busy rolling out some gf eggroll wrappers to make my own gf potstickers. I know it is doable. I just had hoped to enjoy the fruits of someone else’s labors. It sure was a big bummer that we didn’t have the special dining experience that we were expecting. Sadly, I cannot recommend this restaurant to anyone, even though I didn’t get glutened, it was not a meal I enjoyed at all. I hope no one else ever feels this way after dinner there but I think that is a forlorn hope.